My thoughts about an EMP attack. I have read several articles about a possible EMP attacks and what would happen in the aftermath. 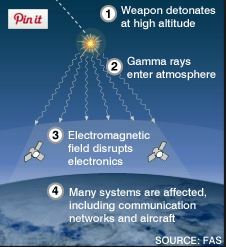 First I will explain what an EMP is for those that do not know. An EMP stands for Electro Magnetic Pulse. The easiest way I can explain how this work is to think about a stone dropped into still water, the stone creates ripples that move away from the point that the stone was dropped. 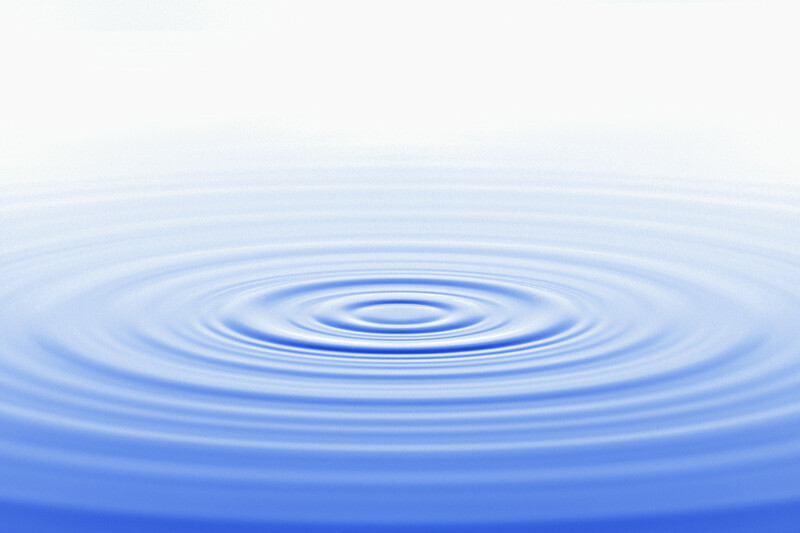 The stone represents a device that creates the EMP, and the ripples are the EMP wave that travels through the air. When this ripple of magnetic energy crosses a metal object it induces an electrical charge, otherwise known as voltage. If the electrical charge that is induced is strong enough and crosses electrical devices it may damage electrical devices. What happens is the components inside electronics like your car, cell phone, or computers are designed to work with very low electrical voltage. And EMP wave could induce voltages that are much more than the electronics can handle and it destroys them. In devices with a memory, such as hard drives and SD cards, the data could be erased. For people that have implanted devises like pace makers or internal hearing aids this induced voltage can hurt or even kill a person. To protect electrical devices against and EMP wave they need to be inside a Faraday cage. A Faraday cage is a surrounding of metal that is connected to an electrically grounded source. The Faraday cage gives a path for the EMP wave to travel through to a ground source, or at least around an item, and not damage the electronics inside the cage. 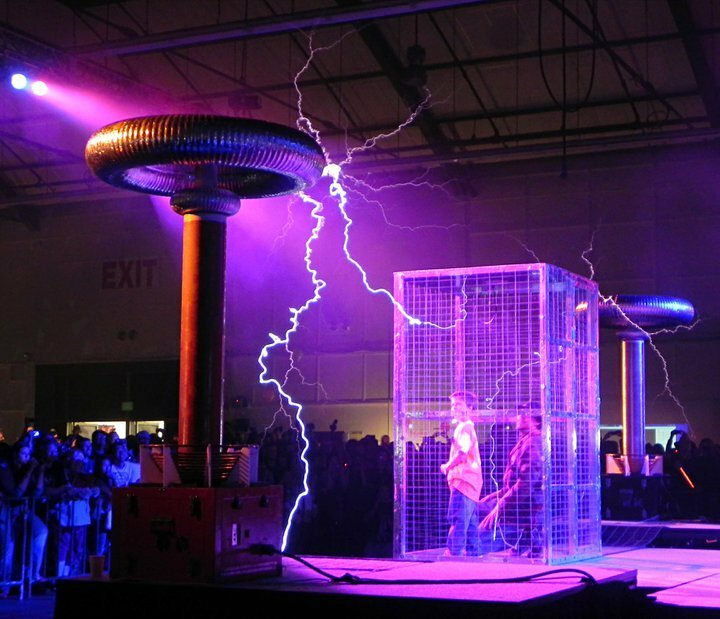 In the photo below you can see people inside the cage, they are safe from the bolts of voltage that is coming from the Tesla coil on the left side of the photo. The bolts of voltage in the photo are very similar to and EMP wave. The voltage travels through the cage to a ground source and does not hurt the people in the cage. One day at work I realized that the building I was in was covered in sheet metal siding. That siding is screwed to the frame of the building. The frame of the building is connected to ground rods. Technically this makes the entire building a Faraday cage. In the winter season when all the doors are closed it should be a good cage, the doors are covered in aluminum sheeting, and connected to the rollers, that are connected to a metal track, that is connected to the building. So this makes the entire building a closed cage. In the summer months all the doors are open, leaving large holes in the cage. These holes would allow the wave from an EMP to enter the building and affect electrical devices. Where would an EMP come from? Most people believe that it will come from a missile from another country. Personally I believe that this attempt to EMP us will not work. NORAD watches the skies over our country and a long way from our shores. NORAD would be able to see the missile coming and shoot it down before it could reach its target. Our enemies know we are watching them and how hard it would be to get a missile through. The James Bond movie Goldeneye is about a space based EMP weapon. The plot of the movie is to hack into bank systems and transfer all the money to other bank accounts, then EMP the area to erase the money transfers and where they went. There would still be a record in the other banks of where the money came from, but it was a movie and that little fact did not matter. I don’t know if any country has a space based weapon like that, but I am sure that there are several countries that are trying to develop one. I believe that it is more likely that a smaller EMP device would be used that can be transported easily on the ground in a common vehicle. It would be harder to detect this kind of attack, and easy to move it into a target area. From my limited knowledge of these kinds of weapons there are no working weapons like this, not yet. So how bad would it be after and EMP attack? This has been the subject of many debates by so called experts. Some say only electronics that are on when hit with an EMP will be damaged. Some say all electronics that are not shielded by a Faraday cage will be damaged. Some say all electronics that are not electrically grounded will be damaged. This all depends on how strong the EMP wave is that hits the electronics. And there are others that say nothing will happen to electronics. It seems that no one really knows what will be affected and how badly they will be affected. 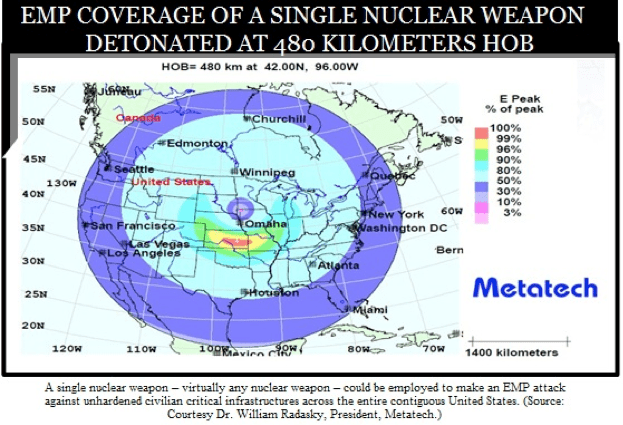 In a worst case scenario all electronics will be destroyed in the direct area, and less affected the farther from where the EMP wave originated. This would mean no electrical power because power plant electronics would be damaged and the plant would stop working. With no power plants running everything else will stop working, that is if they were not already damaged from the EMP wave. How long it would take to repair all this damage all depends how long it would take to get new parts to replace all the damaged ones. That may take years to get some components because of the time it takes to make them, and some parts are made by a very small amount of manufactures. I have a few suggestions to prepare for an EMP attack. One, build a Faraday cage big enough to store all the electrical devises you need, including parts for your own electrical power system like solar panels, charge controllers, and batteries. Two, prep as much as you can and have tools around to help you survive that are not electrical powered but human powered. You also need to be prepared to defend what you have as you are staying were you are. Three, move out of the affected area if you can. This is what most people will do if there is someplace to go that was not affected. My thoughts about an EMP attack, if an EMP attack ever does happen, it will not be good. Even a small one can create major problems that result in many people dying. An EMP attack is low on my list of possible attacks that could happen, but it could happen so it is best to be prepared in some form for an EMP attack. I dont think a large country wide attack will happen, but smaller directed attacks. I believe that cyber terrorism, sabotage to our infrastructures, or a pandemic are much more likely things to happen. To create and EMP attack like a missile strike would take a lot of money and people to build and deploy a weapon of that kind. This would mean it is a foreign government that has those kind of resources. As I said above NORAD is always watching our skies, and I do believe that they would be able to stop a missile attack. Personally I am not very worried about and EMP attack. I know there are some out there that are wrapping there home with tin foil to protect against it, but I dont think its time for that. In the future I do believe that there is a much greater threat of an EMP attack when the technology advances to the point that it can fit in a small truck and be transported close to a major target. As with everything in life it is up to each person what they believe and how much they prepare for possible future events. As for an EMP, I am not prepping for it very much. Previous PostWhen The Fault BreaksNext Post10 Tips On How Prepping and Homesteading Saves Money. As long as you back link to this site.